Make Your Original Tea at Lipton Fruits in Tea in Omotesando! 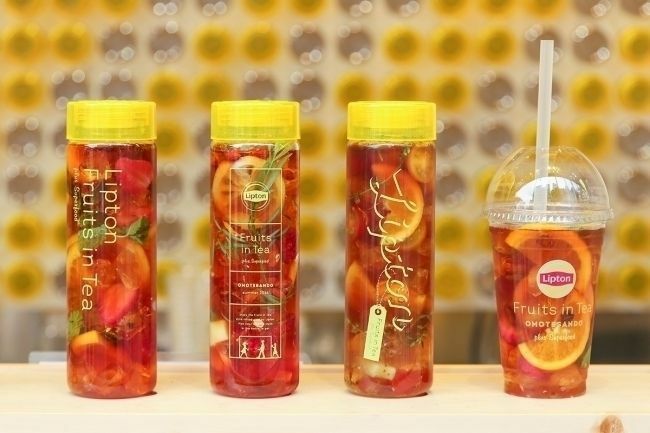 Lipton Fruits in Tea is a temporary store that is open at Omotesando street. It is open during summer, from June 28th to August 27th, 2017. If you are in Tokyo around this area, make sure to check it out! Lipton is a popular tea brand worldwide, and they opened their temporary store in Omotesando. What's special about this place is that they let you make your original tea! Less than a minute walk from Omotesando station B3 exit, you get to refresh yourself with your customized tea. First you can choose a container: a tumbler (¥1,000) or a cup (¥600). 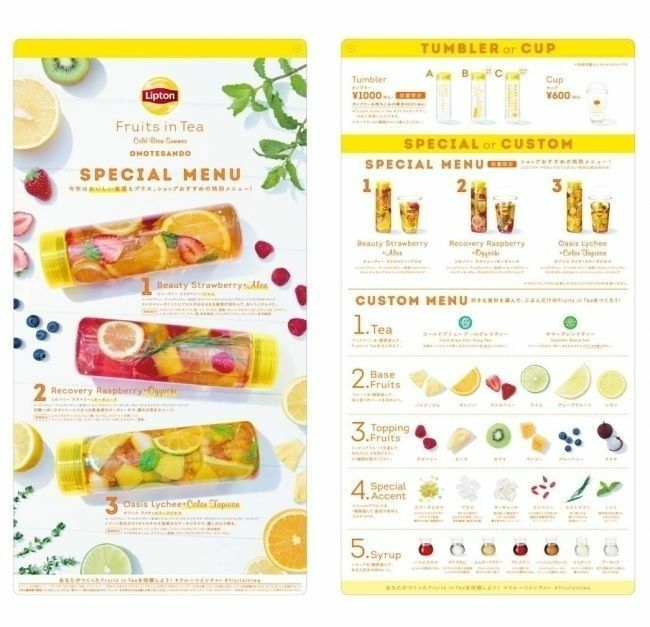 If you already own a tumbler from Lipton Fruits in Tea, you can get their tea for ¥600. Then you'd have to choose whether you want special menu or custom menu. Special menu is a drink that you cannot make by customizing, and custom is you can make your only-one-tea in the world. Special tea includes "Beauty strawberry + Aloe", "recovery raspberry + ogyochi", and "Oasis lychee + color tapioca". If you want to custom your tea, you can choose the kind of tea (cold brewed earl grey or summer blend tea), base fruits (pineapple, orange, strawberry, lime, grapefruits, or lemon), toppings (any two from raspberry, peach, kiwi, mango, blueberries or lychee), "special accent" (colored tapioca, aloe, ogyochi, goji berry, estragon or mint), and one kind of syrup from 7 options! Did you know that shaking a tea will bring out its herbal and fruits flavor really well? Also, another good-to-know fact is that you can ask for a refill (only tea)! They have a tea made specifically for refill called "Cold brew daily arrange tea". Enjoy your original tea at Lipton Fruits in Tea, Omotesando until August 27th! They usually have long lines before the store opens, so if you don't want to wait in line it's recommended to be there early!